We're used to hearing how technology is going to replace the jobs of those doing mechanistic jobs - but this book takes on the impact that technology will have on the professions. I've only given the book three stars as it feels rather too much like a textbook (admittedly a well-written textbook), it's fairly repetitious and there's limited coverage of the science and technology behind the move. However this doesn't detract from the fascinating aspects of the book. The authors' assertion is that these roles can be subject to a kind of production line breakdown of tasks, some parts of which can easily be accommodated by information technology or less qualified individuals. The argument is that not only will this reduce costs where, for example, companies are reluctant to continue paying through the nose for corporate law (bye bye Suits), it also has the potential to open up these services to a much wider clientele that is presently largely excluded or at least has significantly reduced access. Of course there are plenty of objections (often from those involved in the professions) which the authors largely succeed in knocking out of the way. For example they point out that this move will probably reduce the earnings of many professionals - but as they observe, these roles are not there for the benefit of the professionals but for their clients. Inevitably there is quite a lot of futurology style guesswork here. 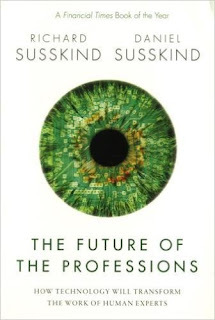 The authors point out they will often be wrong in detail - but argue convincingly that the professions are going to go through a major upheaval in the next generation. It's amusing, given the authors' assertion that 'in the professions, knowledge resides in the heads of professionals, in books...', using this as a mark of how out of step the professions are in the internet age... that I should have been reading this in a book, rather than, say, a blog post or electronic magazine article. However this still remains a title of interest to anyone either involved in a profession (traditional or more modern) or interested in the future of the middle class.